modified concretions). Both males and females are shown in repetitive postures. Stone females usually stand, while clay females may stand but usually sit; these repetitive postures may suggest different deities or different aspects of a single deity. Stone males are nearly always seated, often on an animal's back; Mellaart identifies many of these animals as bulls, but the absence of horns, and similarity of spotted and unspotted heads, suggests to me that the animals are felines. Among the securely identified figures, both males and females are associated with leopards. More important, these beings control the animals, which are clearly dangerous based on the red painted mouth and paws of the leopards in the building where so many stone figures were found. By extension, gods and goddesses control the wild and the dangerous. At present, archaeological data that would allow us to link social, economic, and political change to changes in Neolithic ritual and ideology are limited; however, a consideration of the squence at Catal Hoyuk provides some preliminary insight into the timing and possible importance of such changes. The chronological distribution of the figurines and mural art suggests that there is a shift in religious practice at Catal Hoyuk between levels VI and V. Level VI is dated to approximately 7,500 bp or 5,800 BC by radiocarbon dating (Mellink 1992:Table41, roughly contemporary with the transition between the Final PPNB and Pottery Neolithic in eastern Anatolia, northern Syria, and somewhat later than this transition in the south-central Levant. 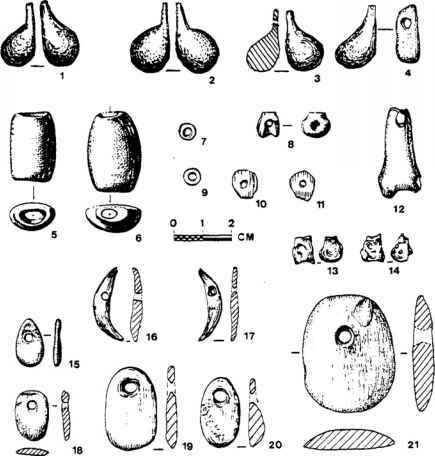 Before level V stone figures of males and females were made and used, and these figures have some stylistic links to figures from PPNB site of Nevali Cori to the east, where context suggests use in community-wide ritual. Personal rituals at Catal and the Euphrates sites are documented by small clay vehicles of magic. The stone gods of level VI are destroyed, gathered, and effectively entombed. The precise reasons behind this deposition cannot be determined, but a rare ethnoarchaeological study of figurines conducted by Warren DeBoer (1995) indicates that the deposition and destruction of a number of images with ritual significance will only occur when the images lose power.